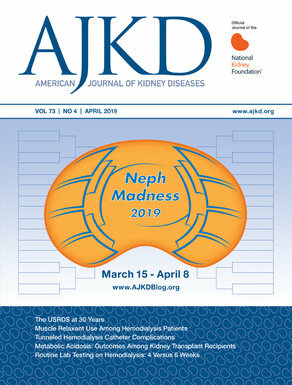 Sagar Nigwekar, MD, MMSc and Teodor Paunescu, PhD (SN & TP), from the Massachusetts General Hospital in Boston, Massachusetts, discuss their abstract for the National Kidney Foundation’s 2016 Spring Clinical Meetings (SCM16), Olfactory Defects in Renal Disease, with Dr. Kenar Jhaveri, AJKD Blog Editor. AJKDblog: Why don’t you tell us a little about your research and abstract being presented at the NKF 2016 Spring Meetings? SN & TP: Malnutrition is prevalent in kidney disease patients and is a recognized risk factor for poor outcomes, associated with increased morbidity and mortality. However, there are no effective treatments currently available to address this complication. Food aversion is known to be a major contributor to anorexia and malnutrition in end-stage renal disease (ESRD) and also impact the patients’ quality of life. Olfactory defects could lead to symptoms of food aversion and anorexia; however, which specific defects exist in renal patients and their etiology and contribution to the pathogenesis of malnutrition remain unclear. Consequently, we decided to quantify olfactory deficits in advanced chronic kidney disease (CKD) and ESRD patients and to investigate the association between smell loss and malnutrition. We found that patients with kidney disease have significant olfactory deficits that need objective assessments for accurate characterization. Our results also indicate that olfactory deficits likely attribute to nutritional impairment in patients with kidney disease. AJKDblog: What do you think accounts for the causes of the olfactory disorders you found? SN & TP: Actually, the absence of an effective intervention to alleviate olfactory deficits in kidney patients can be explained at least in part by the lack of consensus on the underlying mechanisms. Possible explanations suggested in the literature range from the accumulation of uremic toxins impairing the olfactory capacity or inducing polyneuropathy to the removal of nutrients by dialysis impairing the regeneration and renewal of olfactory epithelial cells. Most importantly, however, the olfactory impairment has been suggested to be physiologically reversible, and this provides a strong motivation for our work. We are in the process of investigating the mechanism of the olfactory disorders found in kidney disease patients. Our collaborative research team includes scientists with both basic and clinical research expertise, and we are applying our experience in epithelial cell biology and pathophysiology to understand the causes behind these smell deficits…from bench to bedside! AJKDblog: Where do you and your group go from here? SN & TP: At present there is no effective treatment available to improve olfactory function in CKD or ESRD patients. Our ultimate goal is to have an intervention that can alleviate smell loss, thus improving nutrition in kidney patients. The data we present at the NKF 2016 Spring Meetings provide rationale for a proof-of-concept clinical trial that we recently intiated: Helping Olfaction and Nutrition On Renal Replacement (HONORR trial). More details about this trial can be found at: https://clinicaltrials.gov/ct2/show/NCT02479451. All Spring Clinical Meeting abstracts are available in the May issue of AJKD. Check out more AJKDblog coverage of the NKF’s 2016 Spring Clinical Meetings (#SCM16)!